Only New Orleans beat us out. We came in ahead of Kalamazoo, Austin and Nashville based on cost of living and concentration of people working in a creative field. 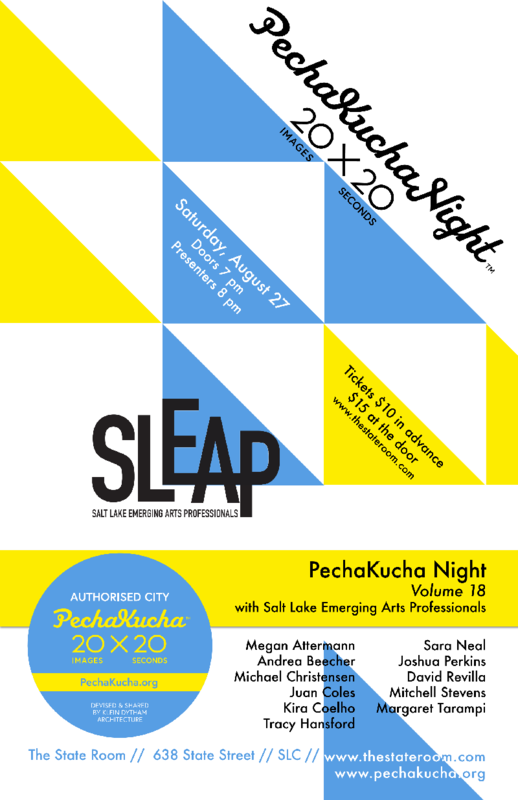 Some of these creative Utahns will be found Saturday at PechaKucha, or literally “chit chat” in Japan, where this interesting worldwide happening began. It’s an evening of 20 images presented for 20 seconds each by various presenters, this time emerging Salt Lake arts professionals ranging from Andrea Beecher, an interior designer with an impressive portfolio of residential and commercial work to Michael Christensen, programming director at the Utah Arts Alliance, an organization whose mission is to foster all art forms to create an aware, empowered, and connected community. Christensen is fascinated with how GAMES can be used to foster more productive work environments as well give us insight into how we can bring nonprofit organizations into the 21st century. David Revilla is a graphic designer for the Daily Herald newspaper; Kiki Furia is a Cosplay model and gamer involved with the Utah Afterschool Network; Margaret Tarampi is an architect, psychologist and accomplished visual artist who is currently a research associate at the Center for Spatial Studies at University of California Santa Barbara. Megan Attermann, Tracy Hansford, Sara Neal, Joshua Perkins and Mitchell Stevens also are on the creative ticket Saturday at the State Room, 638 S. State. Doors at 7 p.m.; show at 8; 21 and over. Tickets are $10 from ticketfly.com. You’ll also find the creative spirit alive at the Rose Wagner Arts Center, where this Saturday “Rose Exposed” returns for its fifth annual edition. Each year Rose Exposed features short, themed works created in a day by performing arts companies resident at the Rose Wagner Arts Center: Gina Bachauer International Piano Foundation, Plan-B Theatre Company, PYGmalion Theatre Company, Ririe-Woodbury Dance Company, Repertory Dance Theatre and SB Dance. This year’s theme is “Flight” and all proceeds go to support Tracy Aviary in Salt Lake City. Pygamlion Productions, which does this and that, have invited Fran Pruyn, Browen Beecher, Tamara Howell, Stephanie Howell, Jeanette Puhich and Brenda Sue Cowley to show up at 9 am with a guitar, a violin, two songs, a poem, some black cloth and an idea. By 8 pm the audience will discover what they’ve put together. Each company will embrace a similar creative process as they create works throughout the day. 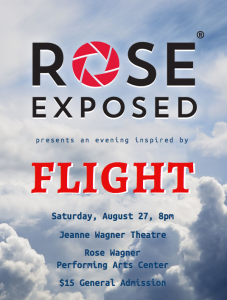 They will rotate through the Jeanne Wagner Theatre in rehearsals that are open to the public at no charge and require no ticket (all rehearsals below also involve Gina Bachauer International Piano Foundation). Come at 8 pm to watch the final products. Tickets are only $15. For more information visit http://roseexposed.org.